Between 1984 and 1986, when games were getting big and the software world became an industry, the most famous, most praised and most successful software house was Ultimate Play The Game - but the programming stars of Atic Atac and Knight Lore were secretive and gave no interviews. In 1986 Ultimate began to fade, and by 1987 it had virtually disappeared. But under a different name Ultimate was working on a new project - and could soon be back at the front of the next revolution. ULTIMATE PLAY THE GAME became a household name in software households just weeks after Jetpac and Pssst were released in 1983, getting the company's Spectrum career off to a scorching start. The packaging boast of 'arcade quality graphics' was more justified than for any other game of the time, and the gameplay and sheer fun to be had from Ultimate's first releases was astonishing - they were packed into only 16K of memory. "Basically we're all arcade players and we're all arcade addicts"
Two more 16K releases followed - Cookie and Tranz-am - and when CRASH was launched in 1984 we were treated to the even more complex 48K games, Lunar Jetman and Atic Atac. Between 1983 and 1986 Ultimate had an unbroken chain of 14 Spectrum hit games; most were reviewed in CRASH, and their Overall ratings averaged at 93%, making Ultimate the magazine's most highly-praised software house of all time. Ultimate's quirks as well as its games made it legendary: for instance, Ultimate Play The Game was actually the trading name of Ashby Computers and Graphics (ACG), immortalised in Atic Atac's Key of ACG and Sabre Wulf's Amulet of ACG. It all made for good stories, so computer journalists clamoured over the phone and even hammered at the front door for that all-important exclusive interview. But the harder everyone tried, the more adamant Ultimate became about its press silence - and indeed very little was known about the software house, which never even showed its wares at exhibitions after one early experiment. The nearest anyone got to a foot in the door was when CRASH found some favour with Ultimate's nearly-invisible owners. They ran several competitions and even promised an interview - but always only after the next game was completed, and that tomorrow never came. Based in the Leicestershire town of Ashby-de-la-Zouch, Ultimate was wholly owned by one family: two brothers, Chris and Tim Stamper, and Tim's wife Carol. With one or two other programmers - or 'software engineers', as they prefer to style them - the Stampers were Ultimate. The two brothers had started as designers of real-life arcade machine programs - but they made no marketing mileage out of this coin-op background, exotic enough in those heady early days (and still rare in Britain), preferring to stay in Ashby-de-la-Zouch and produce games. And it was as though the games really did speak for themselves: magically, Ultimate avoided the criticisms usually attracted by standoffish organisations in the professionally friendly entertainment trade. Each Ultimate release was eagerly awaited, and whenever a game was delayed magazines were flooded with complaints, as though the editors could do something about it. And when rumours circulated, originating from an all-too-unusual (and all-too-sparse) press release, that Knight Lore was to feature an entirely new three-dimensional concept with superb animation called Filmation, anxious readers ran riot with their letters. Knight Lore was revolutionary. It brought about a new genre, the forced-perspective (or isometric) 3-D arcade adventure; one CRASH reader has claimed it became the second-most cloned piece of software after the word processor WordStar. But by the end of 1985 it seemed Ultimate's magic might be waning, though veritable hero-worship kept the company's profile high well into 1986. Something had gone: the flair seemed missing, we wondered if the originality had ossified, letters kept sadly referring to the 'once-great' software house. Inevitably, when someone has been on top so long detractors start sowing seeds of gloom, and as Ultimate slid CRASH readers' letters were harping on the similarity of so many later Ultimate games. Looking back, though, it seems incredible that Ultimate kept its supreme position for so long, always producing original games that went straight to the top of the sales charts. Despite its fall from fame, it remained a major label, and after a rumour that Ocean had bought the company it was announced that US Gold had won out and taken over Ultimate. The terms of the sale were obscure; the Stampers retained a majority shareholding, and Ultimate games continued to appear, though to less and less acclaim. But a clue, shrouded in the mists of corporate obscurantism, lay before all: the small, typically mysterious, 'concept and coding' credit for some of the later Ultimate games - Rare Ltd. The Ultimate software label has been largely dormant since mid-1987, and though the Stampers still have an interest in it, 2 years ago they formed a new company, Rare Ltd, and moved from Ashby-de-la-Zouch to the nearby village of Twycross. It's there that the Stampers are working on a new generation of games, and it was there that they gave CRASH the Ultimate story. Twycross is a tiny Midlands village perched on the borders of Leicestershire and Warwickshire, known only for its zoo. Sitting on the western edge of the village is a very large 18th-century mansion, part of Manor Farm. This is the home of Rare, protected by rambling outbuildings, barns and a crowd of noisy cockerels and chickens. It's an elegant though rather dilapidated building, gradually begin repaired by the Stampers, and its calm, very country-English exterior belies the power of the technology within. The inside is half-finished, but in the board room a row of clocks on the wall shows the times in Japan and America - all part of Rare's international market. And what illuminates Rare's operation is the Stampers' intimate working knowledge of their hardware. Very little equipment in the mansion is as it came from the manufacture; even the modest Amstrad PCs have been given vitamins. That's the style of the two former coin-op designers, of course, and it was their technical knowledge of the Spectrum as much as their imagination that kept Ultimate playing the games so long. I started with the most obvious burning question: why did Ultimate disappear about one and a half years ago? Perched on the edge of a massive desk, 32-year-old Tim Stamper, who acts as the company's business spokesman, thought for a moment and then corrected me slightly. That's what people said at the time: that Ultimate had gone as far as it could with the Spectrum. But what about the 1987 games like Bubbler and Cyberun? Tim insisted that was the post-Stamper Ultimate's work. But even before Gunfright Ultimate had come in for magazine criticism - Sabre Wulf is a copy of Atic Atac, Alien 8 is a copy of Knight Lore, and so on. 'It was funny to read the reviews,' recalled Chris. 'A lot of the earlier reviews were actually incorrect. It never really affects you. You know whether the product's good or bad. Tim observed: 'CRASH always gave us fair reviews, but with some of the other magazines, if we didn't advertise, the product got a bad review - and I was actually told by a few of the other companies that they thought the problem existed as well - and I'm sure it's still there now. Talk of fan mail prompted Tim to make a point. 'I think we had an opportunity to capitalise on the sort of fan club Ultimate created. So many people wanted more information on Ultimate, and sweatshirts and caps and that. 'We could have expanded, like some companies did, with a large fan club and giveaways and posters to buy, and we could have said, 'If you like Ultimate, buy the games, buy sweatshirts,' but in fact we gave them all away. Today's software houses, anxious to keep buyers happy with bugless games, regard playtesting as essential. But despite Ultimate's string of hits, the Stampers never employed hordes of young playtesters as the old Imagine used to. 'We rely on friends and friends of the family,' said Chris, 'usually people a lot younger than ourselves, to play the game. We like to see their reaction to the game from fresh. It's very easy for us to see what the problems are when they start to play the game. Basically we're all arcade players and we're all arcade addicts. No game is perfect, and with hindsight the Stampers can often see something they should have done better. 'But when we've finished a game, all we can see is all the hard work that went into it. It takes a long time before you can look at it with a different eye; you always remember all the problems and all the concepts that were thrown out, all the stages of development. A mystery in one Ultimate game always annoyed even the label's staunchest fans - so I demanded the definitive company answer. 'Was there ever a trailer in Lunar Jetman?' I asked. Yes, I told him, that was in CRASH. A reader sent it in, but obviously it was a hoax - or was it? I added that the graphics looked very authentic. Tim merely laughed. And so the mystery persists. But mystery was Ultimate's fifth name. Was it a conscious policy to be mysterious? Was it seen as good PR? 'No it wasn't,' said Time, 'that's the way it turned out, we were so busy producing a few products a year and making sure they were right. I think while we were full-time Ultimate, we only had two Christmas mornings off, and that's how hard it was. We worked seven days a week, 8am till 1 or 2 in the morning. I don't feel it's any good having engineers who only work 9 to 5 because you get a 9-to-5 game, you need real input. 'And the day a product was released the phone would just be red hot with all the distributors ringing. It was really bad...' His voice trailed off. 'I prefer it here without those sorts of pressures,' Chris added. 'It's just a development place, the atmosphere for development we have in his place is excellent. It's a nice rural setting with chickens all over. It's a farmhouse and we want to keep it that way because it gives you something to refresh yourself. Still, the 6-acre Manor Farm isn't really a working farm, explained Tim. 'There are a couple of horses here, and all we have to do is chuck them out in the field in the morning and bring them in again in the evening.' So there's no getting mucky for Rare's 13 full-time staff - they can concentrate on designing games. "When the Spectrum came out we thought 'what a piece of garbage!'. But there's something about it, to have lasted this long is amazing." 'We scribble them down and file them away,' Tim went on, 'and then when we're ready to start a new team off, we just go through the files and decide which one to produce, which is best for the time of year and the current trends. It must have seemed a step down for Tim and Chris Stamper, used to designing coin-op games and licensing them to America and Japan, to give up all that dedicated hardware and memory and work with the 16K Spectrum? 'I think it was easy for other Japanese and English companies to copy, but for the home computer and the UK he really did it first, and it was just a colossal idea. 'A good design stands the test of time. It's just a pity they didn't upgrade it at the right moment. Possibly Sinclair was too involved with it and the good sales he was getting - because there wasn't anything else [as] cheap as that, or with the software range - just kept him on the same track. Almost all of Rare's staff posed outside Manor Farmhouse. 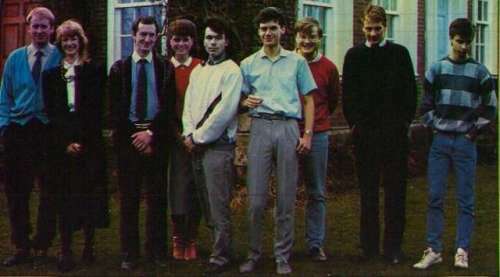 Left to right: Tim Stamper (graphics director), Carole Stamper (company secretary), Chris Stamper (software director), Rachel (secretary), David (sound dept), Mark (software head), Paul (software), Steve (graphics), Kevin (graphics). The Spectrum's extremely limited sound could have posed a problem for Ultimate's programmers - one common criticism in the old days was that Ultimate games needed better music and sound effects. Today a Spectrum-owner will be stunned by the quality of rich sound on his first confrontation with a 16-bit machine - an Amiga, say. But neither of the Stamper brothers is particularly impressed by the much-hailed 16-bit revolution. And the Stampers are sceptical about the size of the 16-bit market. Their philosophy is to be original and creative within a large market; in Ultimate's heyday, a game like Sabre Wulf would sell more than 350,000 Spectrum copies (far more than Activision's 1985 Ghostbusters, widely accepted as the all-time best seller at over 250,000 copies on all formats together). 'We were having a severe problem with the number of (illegal) copies. And I think going from £5.50 to £9.95 was a bold step we took. The price was gradually creeping up, and I thought we might go the whole way and put the product out at a price which was realistic for the time involved in creating it. 'Knight Lore was finished before Sabre Wulf,' Tim suddenly said. 'But we decided the market wasn't ready for it. Because if we released Knight Lore and Alien 8 - which was already half-finished - we wouldn't have sold Sabre Wulf. 'So we sold Sabre Wulf, which was a colossal success, and then released the other two. There was a little bit of careful planning in there. But they could have had Knight Lore possibly the year earlier - we just had to sit on it because everyone else was so far behind. Careful planning is the hallmark of the Stampers. They recognized long before anyone else that they had done everything the could with Spectrum games, and thus phased Ultimate out. But that was only one reason for the Stampers' move: and having dropped the Knight Lore bombshell, Tim dropped another. Sabrewulf, written after Knight Lore!! When Ultimate bowed out, most people in Britain had heard only the faintest mumblings about the Nintendo. But Chris and Tim had discovered the dedicated console through their contacts in the Japanese coin-op industry, and started planning Nintendo games about the time they were coding Lunar Jetman - 1983! And as a result of their foresight, Rare is already competing with the big names in Japan: Konami, Nintendo, Sega and Taito. The Ultimate people could do for the Nintendo now what they did for the Spectrum 4 years ago. 'A lot of UK companies are beginning to look overseas,' Chris added, 'and to look at machines which are not available in the UK. We did that 2 years ago. And I think it puts is in a very unusual situation. Tim: 'We actually act, I suppose, as Nintendo's development team. If they feel they are lacking a product on a machine, they tell us, we develop it, and so we are sure of licensing product to them. The majority of companies, like Konami and Taito, construct a deal with Nintendo to produce a product for Nintendo to market. Rare has seven Nintendo products either finished (one was done 2 years ago) or nearly completed, and another eight in development. They've all had to be designed with the tastes of the Japanese market firmly in mind. 'There is a difference in style and there is a difference in what makes a good game for the US and Japan,' mused Tim. 'I think we understand now what that difference is. And our success rate proves that. Rare hopes to be able to help programmers understand the essential differences. In fact, one reason for giving this interview was to appeal for freelance programmers and development teams to contact Rare - the Stampers' teams need backup in producing both Nintendo games and original coin-ops. On the coin-op front, Rare has developed an extremely fast and powerful 64-colour arcade board. Called the Razz Board, it's based on the Z80 processor with a lot of hardware assist, and 14-voice Yamaha synth chips for the sound. Another Rare idea is growing in the large, airy barn just outside the mansion, where Tim hopes to construct studio lighting and turn his graphics into animated movies for viewing on computers. The price of memory is dropping, so that future could come soon. And Chris finds it surprising that so few British programmers have seen the huge potential of the Japanese market. 'With all the talent in the UK and with all those thousands of people writing games, I feel it should be UK companies producing the Number One arcade games and then everyone in the world following that - because Britain's got the best talent, without a doubt.